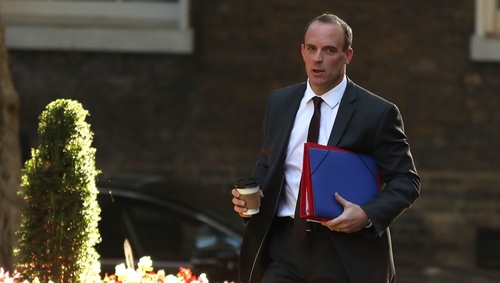 Britain and the European Union are "closing in" on a withdrawal agreement, UK Brexit minister Dominic Raab has said, ahead of a meeting of European leaders in Salzburg next week. Britain is due to leave the bloc on 29 March but has yet to reach a full exit deal with Brussels, and some rebel politicians in British Prime Minister Theresa May's Conservative Party have threatened to vote against any agreement unless she changes her proposals. Both London and Brussels are hoping to reach a deal by mid-November. Mrs May has said next week's informal EU summit will be a "staging post" in the negotiations that will allow the bloc's leaders to discuss her Brexit plans for the first time. "While there remain some substantive differences we need to resolve, it is clear our teams are closing in on workable solutions to the outstanding issues in the Withdrawal Agreement, and are having productive discussions in the right spirit on the future relationship," Mr Raab said after a phone call with EU chief negotiator Michel Barnier. Mr Barnier said on Twitter that he had had a "useful dialogue" with Mr Raab but that key differences remained between the EU and Britain over the future of the border on the island of Ireland and the EU's system of protecting food names. Yesterday, the British government published a set of advice notices for the British public on how to prepare for the possibility of a "no-deal" Brexit, and Mrs May held a meeting of her top team of ministers to discuss the government's plans for leaving without an agreement. Bank of England Governor Mark Carney told the meeting that Britain's property market would crash and mortgage rates would spiral up in the event of a chaotic no-deal Brexit, with house prices falling 35% over three years, the Times newspaper reported. Pro-Brexit rebels in Mrs May's party have become increasingly vocal in their opposition to her Brexit proposals this week, with one former junior minister saying 80 or more Tory politicians were prepared to vote against them. Labour Party's foreign affairs spokeswoman Emily Thornberry told the Financial Times her party was set to vote against any Brexit deal and the lack of a viable exit from the EU would force Mrs May from office before Christmas.